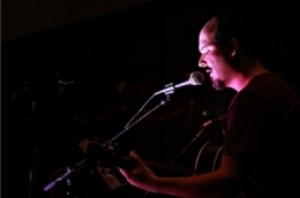 Pablo Naranjo is a singer-songwriter and producer who has recently released 'Black Euphoria', his second album as a solo artist. Pablo is originally from Colombia and moved to Australia in 2004. In 2001 he recorded his first album leading the progressive-grunge band Septimo Aposento (The Seventh Room), who were invited to perform at large rock festivals. In Australia he formed Orbeum, a classical/jazz instrumental guitar duo with guitarist Warren Wickremesooriya which recorded the album 'Passages' in 2009. Often described as 'filmic', Orbeum's compositions are an eclectic fusion of styles which have been featured in advertisements and documentaries. They are also a top 20 artist in the ReverbNation Jazz charts for Victoria, Australia. 'Here in the Distance' (2013) was Pablo's first album as a solo artist. According to the UK music blog Audio Pulse, the album is 'a journey for the soul', highlighting Pablo's love for alternative rock as well as jazz and bossa nova in his guitar work. The album was mixed by renowned engineer Steve Orchard who has worked with artists such as Paul McCartney, Peter Gabriel, U2, Seal and Sting. 'Black Euphoria' (2017) is Pablo's latest release. Recorded at his home studio in Melbourne, Australia, the album travels through different musical landscapes where grungy riffs and psychedelia contrast with funk guitars and lush vocal arrangements. ‘Control’ and ‘Whirlwinds’ display Pablo’s darker and heavier side whereas tracks like ‘Here and Now’, ‘Hot Air Balloon’, ‘Turning Into Stone’ and ‘Transform’ are reminiscent of the rock and funk undertones of ‘Here in the Distance'. The title song of the album ‘Black Euphoria’ marks a new direction in Pablo’s music with the use of electronic beats and trip hop atmospheres mixed with intricate guitar arrangements.